"I swore I'd railroad the two of them, and here's my chance." Although at one time Lon Chaney was one of the biggest box office stars in Hollywood, he hasn't been given very wide exposure on DVD. Kino on Video attempts to remedy that shortcoming with this double feature of two of his earlier roles. Outside the Law (1920) is a hardnosed crime drama with a twist. Chaney plays a dual role here of gangland kingpin "Black Mike"Sylva, and also Ah Wing, a kindhearted student of Chinese philosophy. The performances are astonishingly different. As the film begins, "Silent" Madden (Ralph Lewis) and his daughter Molly, a/k/a Silky Moll, (Universal star Priscilla Dean) are criminals who have come under the influence of Chinese philosopher Chang Low, Ah Wing's mentor. Chang has convinced them to give up their life of crime and take up the straight and narrow. "Black Mike" is offended at their intent to reform and frames Madden for the murder of a policeman. Molly is discouraged at this turn of events and is convinced to return to crime. She narrowly avoids being taken as a patsy when Black Mike informs the police of a jewelry heist she is conducting. Escaping with her boyfriend, another Black Mike henchman, she hides in an apartment, trying to avoid Black Mike's wrath and also the police. Shadows finds Chaney in yet another Chinese role, this time as Yen Sin, a Chinese laundryman mysteriously washed ashore in a storm. Daniel, the abusive husband of Sympathy Gibbs (Marguerite de la Motte) is lost at sea in this same storm. She falls in love with the new minister, John Malden (Harrison Ford), who takes the conversion of the heathen Yen Sin as his pet project. Sympathy and Malden marry, but shortly after the birth of their daughter, Daniel resurfaces, extorting money from Malden and disrupting their lives. Both films tend to lean a little heavily towards melodrama for a modern audience. They do make up for this by avoiding cliches; in almost every instance events take a turn different from what the viewer expects. However, the real reason for watching them is the performances by Chaney. As Burt Lancaster once said, "Chaney could express with his whole body in a few gestures what pages of dialogue couldn't." He steals every scene he is in with his expressive quality, whether as the ruthless and burly Black Mike or the decrepit and scrawny Yen Sin. One would never guess it was the same man, if not for those jug-handle ears that no amount of makeup could hide. Considering the primitive materials that Chaney had to work with, his makeups are nothing short of astounding. That of Yen Sin is quite a bit more accomplished than the more caricatured Ah Wing of the earlier film, but both are striking makeups indeed. Of course, Chaney was far more than makeup; his performances are sensitive and believable throughout. Outside the Law contains a surprising amount of on-screen bloodshed and mayhem; the Production Code was not yet in place and directors had a great amount of freedom in what they could show. Not only is the murder of the policeman shown onscreen, but the final climactic battle has blood pouring everywhere, from the handiwork of both bullets and knives. Somehow knowing that this was done in 1920 before modern squibs and the like were available makes it seem all the more real. There is no John Woo-like ballet of gunfights here; instead Browning gives us down-in-the-gutter earnest homicidal fighting. This film is one of the early collaborations of Chaney with director Tod Browning (Dracula, Freaks). Browning's dark and morbid imagination would often provide the impetus for Chaney's most impressive and painful bodily distortions; only Chaney could make them real and live on the screen. Priscilla Dean makes an interesting female criminal, quite atypical from her usual heroine roles. Both films touch on the West Coast "yellow peril" fears, but in somewhat different ways. In Outside the Law, nearly all of the positive characters are Chinese. In Shadows, Yen Sin is clearly intended to be a sympathetic character, who is roundly abused by the villagers for being different. At the same time, he is one of the very few kindly characters in the film, and is responsible for bringing all to rights at the conclusion. Both films portray the Chinese in a positive light, although in Shadows they have to take a great deal of grief from the Caucasians. Image Transfer Review: Outside the Law starts off well, with a clear, crisp transfer, with occasional speckling, but looking gorgeous. There is a tremendous range of blacks, whites and greys, without the overly-contrasted feeling that one usually gets in silent films. In some scenes, we can even see the greasepaint on the actors. Unfortunately, the last two reels or so of this film have fallen victim to time's ravages. Nitrate decomposition is so advanced in some spots that it's a marvel that we can see anything at all any more. When one considers that fully two-thirds of Chaney's one hundred fifty-plus films are no longer extant in any form whatsoever, we should be grateful that this much of the picture is present. Shadows does not have the egregious problems that the other film does, but its overall picture quality is fairly low. The picture has constant speckling, and the entire first reel has major scratches running through the picture. The clarity of picture that we have in Outside the Law is not present either; perhaps this is a blowup of a 16mm print, which would explain the loss of detail. Once one becomes accustomed to the film damage, however, the picture is watchable. Again, we are lucky to have these films extant at all. Unfortunately, the producers of the DVD chose to use an old transfer, no doubt to make use of the musical scores which they had on hand. This means that the picture is run at a sound speed of 24 frames per second instead of the slower silent speed of 18-20 fps, giving the sped-up and herky-jerky quality that one usually associates with silent film. This is more distracting in Outside the Law; apparently Shadows was shot at a slightly faster frame rate. On the positive side, the films are slightly windowboxed so that none of the picture is lost to overscan. Assigning an image grade for these films is an exercise in averaging. Outside the Law varies from A to F; Shadows is a pretty uniform B-, when one gives some extra credit for the age of both films and the windowboxing. The final grade also reflects downgrading for the overly fast projection rate. Audio Transfer Review: The audio on both films is the typical Blackhawk Films musical score plus sound effects. The effects are pretty poor overall (the pistols sound like cap guns) and not terribly well synchronized. 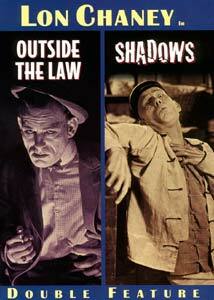 Outside the Law features an orchestral score by an uncredited composer; Shadows features an organ setting written and performed by the late Gaylord Carter, who was an organist for silent films back in the 1920's. Both capture the moods well, the Carter score doing so a little better. The sound is an adequate 2.0 mono, with decent range, but the orchestral score is a little on the crackly side at the beginning. Both are certainly adequate for films of this vintage. Extras Review: The sole extra besides chaptering are brief production notes inside the snapper case cover. These are, however, informative despite their brevity. Chaptering is adequate for films running a little over one hour each. But there's nothing more here to be seen. This DVD gives us an excellent opportunity to see Lon Chaney in non-horror character roles; fans of Chaney and silent movies will definitely want to own this disc. The stories hold up surprisingly well despite their vintage, with some good supporting performances. The film deterioration on Outside the Law is the main detraction, but the visible evidence here should only add fuel to efforts to preserve our film heritage. Recommended to anyone with an interest in silent films.